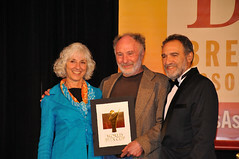 Mari and Will Kemper of Chuckanut accept a medal from Charlie Papazian at the 2010 World Beer Cup in Chicago. Chuckanut Brewery may not be a household name for your average beer drinker, but they make some of the best lagers (and ales) you can get your hands on in the Seattle market. Chuckanut is a breath of fresh air in an environment where super-hopped and high ABV beers often get much of the praise. Better beer bars in the area frequently pour several of their beers, including their Vienna lager, Dunkel, Marzen, Rauchbier, and others. For those of you that have had the pleasure of sampling their beers, you know what I am talking about. For those of you that have not had the pleasure, I’d suggest seeking some out. It’s a happy day when, as an award winning brewery, we can say that some of our favorite Lager beers are now available in the Greater Seattle area. Rarely does Chuckanut Brewery release so many rich lagers at one time but here it is, we suggest beer lovers take advantage of it! Our valentine to all you beer lovers, fall in love again with beer when you taste any of these three lagers. Some people say lager beers are flavorless, well I beg your pardon. They have never had the opportunity to taste these types of true rich lager beers. We already know Vienna Lager is a double GABF Gold Medal winner, the Dunkel won Gold at GABF and the World Beer Cup (beating out the German Dunkel! ), but the secret is the Marzen, yet to hit it’s stride but getting very close!!! The pleasure of all three beers is the beautiful combination of specialty malts and the fermentation process. Using all Weyermann Specialty Malts (one of the oldest malting houses in Germany, located in Bamberg) these beers exude a smooth, flavorful experience in every sip. Each style is brewed to strict style guidelines developed over centuries. Why change something that doesn’t need fixing. Tasting one of these lagers proves the beauty of the style. Vienna lager for the caramel notes, Dunkel for the roasted flavors, and Marzen for a special mix of caramel and full malt nose. All three are equally balanced with a clean dry finish, not a cloying sweetness as some would think using all that malt. This is due to the combination of malts & hops and the care given in moving the beer through the brewing cycle and into fermentation. All three have been delicately and patiently moved along in the ageing process so the end result is smooth and quaffable. Is there anywhere in Seattle where I can get growlers of Chuckanut? Beveridge Place Pub & Naked City Taphouse often have Chuckanut beers on tap, I believe, and both places will fill growlers. Uber Tavern had one of their beers on last week and fills growlers as well. I’d also think that any bottle shops that do growler fills (Bottleworks, Beer Authority, Last Drop, Malt & Vine, etc…) rotate through some Chuckanut every now and again. Love, love, love Chuckanut. But then, I love a good lager. Most recently had the Dunkel at Central Cinema… which I correctly guessed was a Munich-style Dunkel. Unfortunately, they were advertising it/describing it to the customers as a dark wheat (i.e. Dunkelweizen). Dog & Pony in Renton had a brewers night last Wednesday with these guys and has all if these on tap, or did still as of last Saturday. Good stuff. Check out the Chuckanut Brewery Website, http://www.chuckanutbreweryandkitchen.com/find-our-beer.html They have a lot of accounts in the Seattle Area, any of them that sell growlers would probably fill it with a delicious Chuckanut Lager. You have to try the Marzen, finally on tap after more than a year!